The nation's largest clay tennis court facilities could be approved by city officials on Monday. ROSWELL, Ga. -- Local officials are proposing the nation's largest clay center tennis court be built in Roswell, and some local residents are up in arms over the plans. The Angela Krause Tennis, Pickleball and Fitness Center is a 135-court facility that, under current plans, would be housed on 60 acres in Big Creek Park, an area that has almost eight miles of biking and hiking trails. The Roswell city council is scheduled to vote on the plan on Monday, Aug. 13. If approved, the three-phase, $60 to 70 million project would break ground in 2019. Its 80+ clay courts would be more than double the number of clay courts anywhere else in one location. It would also feature traditional hard courts and grass courts, as well as a 24-court pickleball facility. The project was proposed by Roswell residents Vernon and Marie Krause in honor of their daughter, Angela, who died at age 29 after battling a rare form of cancer. Angela was an avid tennis player and member of UGA's club tennis team. But some residents said they aren't thrilled with the plans. Community members say it took almost two decades to develop Big Creek Park into what it is today, full of trails and biking areas. “Big Creek Park is special to me,” said Shawn Brunner, owner of Fresh Bikes, who grew up nearby. “It’s a place that I learned to mountain bike at 20 years ago." It has been seven years since Brunner decided to open up his bike shop down the street from the park, thanks to the help of community members and organizations like Roswell Alpharetta Mountain Bike Organization, RAMBO. But Thursday, Brunner said he found out Roswell city leaders are planning to vote on the 60-acre land that could be transformed into the new tennis center. A petition opposed to the new complex has gained 7,000 signatures. Supporters say Roswell makes sense for the facility because more than 15,000 active tennis players reside in the city, and more than 75,000 other players live within 10 miles of the city. Roswell is also centrally located within the U.S. Tennis Association’s southern section, which is the association’s largest region, with more than 50,000 members in metro Atlanta. 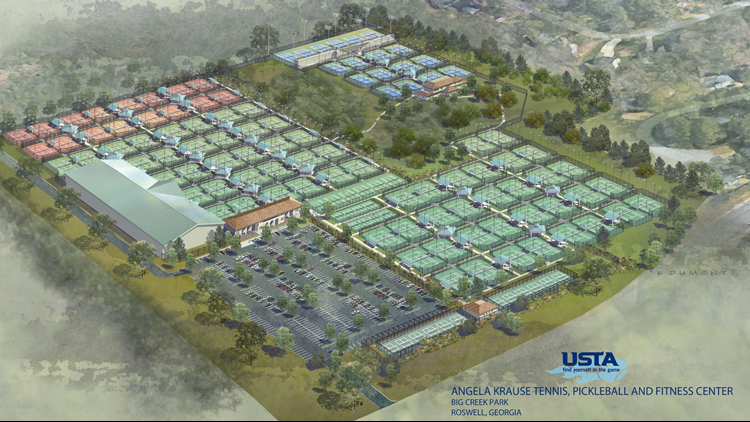 "Roswell is at the absolute heart of one of the largest concentrations of active tennis players in the entire country, making it the perfect location for this project," said Gordon Smith, executive director and CEO of the U.S. Tennis Association. "This facility will not only serve the local tennis players and community members, but will also quickly become one of the most sought-after clay court venues in the U.S."
Supporters say the center will bring an economic impact of $30-$50 million to Roswell annually through tournament play, while also serving as a catalyst for additional investment in the area. “This is one of those projects that we will look back on in 10 years and be absolutely blown away by the positive impact it’s had on the community—both through its economic impact and through the way it will transform our city into a national and international destination,” said Steve Stroud, executive director of Roswell Inc, the city’s nonprofit economic development organization. In a statement to 11Alive, the city said they are still in the early stages of the project. Since the park is city-owned, there had always been plans to develop Big Creek, but they didn't have any money, until now. The meeting being held is not just a vote, but there will be public comment.